Christians today are busier than ever before, doing the "spiritual" work they feel called to out of devotion for God. But are these earnest followers of Christ actually living their faith in a manner that is pleasing to Christ? Whitney (Spiritual Disciplines for the Christian Life; How Can I Be Sure I'm a Christian?) effectively challenges this "busy hands, empty heart" epidemic. 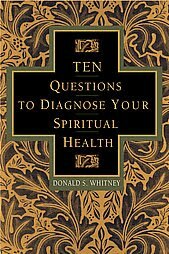 Whitney poses intensely introspective questions to aid Christians as they gauge their own level of spiritual health. Do they have a driving thirst for God, as well as behavior dictated by God's holy standards? How loving to others and sensitive to the Holy Spirit are they? Do they experience genuine grief over personal sin and a willingness to forgive repeat offenders? Whitney also discusses the spiritual disciplines of prayer, fasting, meditating upon Scripture, taking communion and fellowship with others of like faith, showing readers how to transform these often automatic enterprises into faith-building activities. He advises Christians to spend more energy enjoying God and developing a Christlike nature, rather than accomplishing ever-accelerating goals. He notes that seekers must be acutely aware that following Christ is a lifetime commitment and that they should resist the temptation to seek "spiritual" shortcuts to intimacy with God. This timely text is full of gentle admonitions to unearth deeply entrenched habits and dig for the treasure found only in a carefully honed relationship with God.